Once you reach Aquaria, here are some steps to follow to enjoy it to the full. On arrival, in the case of booking, present your confirmation email. You will be given a personal electronic bracelet to open your locker and easily load up all your purchases inside the SPA. Bathing costume and slippers for the swimming pool are mandatory and should be worn in the changing rooms before entering the wellness areas. A cap must always be worn to enter the water. We remind you that Aquaria is principally a place to relax, so everyone is requested to mute mobile phones and not take them in the sauna. Inside the Thermal SPA, there are thermal swimming pools with effervescent bded cervical jets, saunas, steam baths, emotional showers, relaxation areas and much more besides. Given the temperature and composition of the water, between 33° and 37°, a maximum stay in the pool of 20 minutes is recommended, with a 30 minute break between one bath and the other. Since this is sulphurous thermal water, the smell is typical of sulphur and the film on the bottom and edges of the swimming pool is the natural sediment present in thermal water. If your aim is to relax, tone the skin, recover energy or lightness, here are some suggestions for various wellbeing courses. Dedicated to those who wish to recover a sensation of breadth and depth in breathing and increase the intensity of relaxation. Dedicated to those who love high-temperature saunas, wish to stimulate the peripheral circulation and dissolve muscle tension. Dedicated to those who love medium-temperature saunas, wish to dissolve muscle tension and make joint movements more fluid. To improve the blood circulation of the legs or for those with leg disorders, inherited or acquired occupationally. 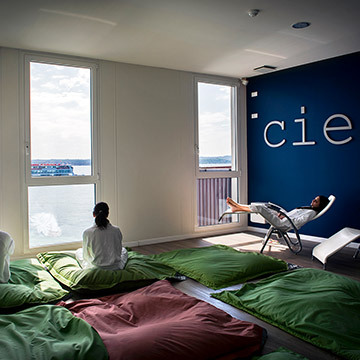 For those who seek deep relaxation and enjoy the beneficial properties of thermal water. It is advisable to be ready to leave the facilities before closing time at Aquaria. 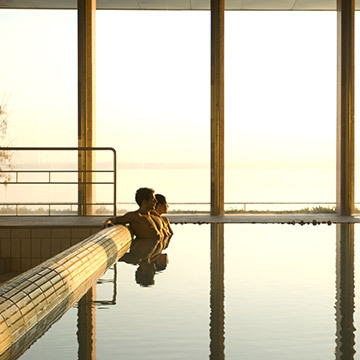 In fact, the thermal swimming pools close 30 minutes early, while the saunas and steam baths circuit, the relaxation area and the freshwater swimming pool close 60 minutes early. 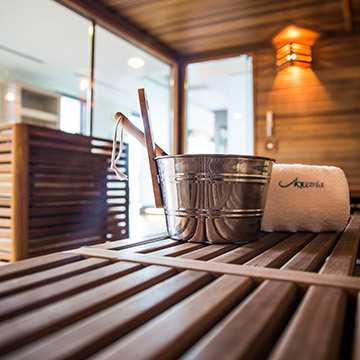 Before your stay at Aquaria, read the full regulations for access and visiting the Thermal SPA. Here is everything you need to know before arriving at Aquaria.